Sandy will be teaching you how to use specialty rulers by making a small project each month. Some rulers will be repeated throughout the year and some months will require two rulers. Since each class is a separate project, you can join one, any, or all of the classes. 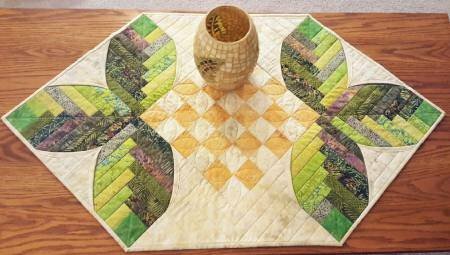 In April, we will be making Cabin Leaves Table Runner using Log Cabin 8" Trim Tool from Creative Grids. Finished size: 23" x 40"
You will need to bring your sewing machine and regular sewing supplies. You will need to have or purchase the required ruler and pattern.